A lifelong Maine artist traveling America and armed with paintings, Milton found our gallery in Bisbee many years ago. As a watercolorist, he has perfected this unforgiving medium. A recent Tucson sojourn brought us many new works in his own fast paced plein air style. 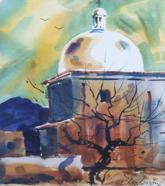 These homages to the southwestern desert include, iconic churches, and the historic barrio of Tucson. Ranch At Terlingua 15x11 SOLD! Sundown At Big Bend Ranch 22x15 SOLD!